The LS is the original, and the flagship model from Toyota’s luxury Lexus brand, and more than any other model it embodies the history and image of Lexus in what the maker describes as ‘a new level of flagship luxury’, writes Trish Whelan. Competitors include Audi’s A8, the BMW 7-Series, Jaguar’s XF and the Mercedes-Benz S-Class. 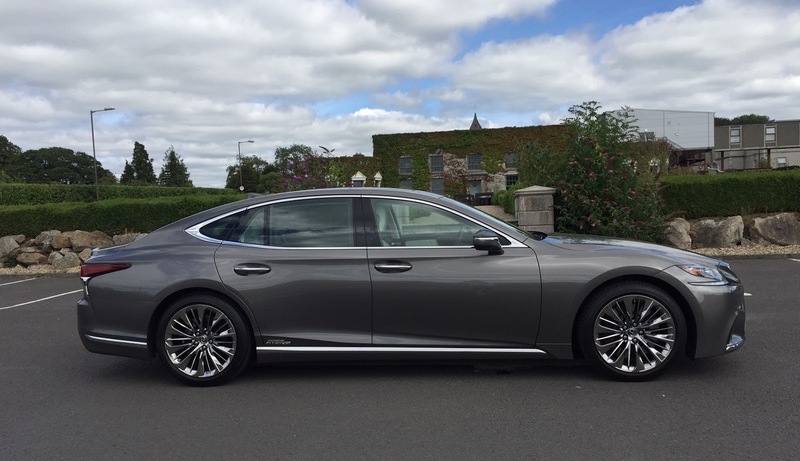 My review car was the LS 500h version, a self-charging hybrid using a petrol engine and an electric motor and this latest model comes with a stunning and unique design, absolutely huge levels of interior comfort and attention to fit and finish. It is longer, lower, and wider than the car it replaced and is built on a new rear-wheel drive platform that the brand claims provides the best-ever LS agility and comfort. It lowers the car’s centre of gravity, offering ‘a more dynamic on-road experience’ while also improving comfort. The exterior is really all about the striking design, but especially the front which is dominated by an enormous grille. I’d first seen this spindle front grille in a Lexus reveal at a motor show some years ago and had wondered if it was a step too far for what was a conservative luxury Japanese brand. But I’ve got to like it over time. Because this LS is lower than before, it gets air suspension with an access function activated when you unlock the car with the smart key. It raises the car and opens the seat bolsters to welcome the driver behind the wheel. The interior was inspired by traditional Japanese aesthetics resulting in a calm and peaceful interior. Craftsmanship is superb in each and every detail. My car came with soft white leather upholstery and some wood trim which I always enjoy as, for me, it offers a bit of tradition to a very modern cabin. There’s no excuse for a driver not getting a perfect fit behind the wheel as both front seats are 28-way electrically adjustable, with memory settings, and also feature heating, cooling and massage which always puts a smile on my face when I use it. There are numerous good storage areas around the cabin. Luggage capacity is 430 litres. There is just a tyre sealant kit, no spare wheel. The centre of the dash is taken up with a 12.3-inch infotainment screen that controls the audio, phone, temperature and more, and is operated by a flat touch pad. I found this to be quite finnicky, even when changing radio stations, as it can involve you taking your eye off the road for too long. I’d prefer a simpler method. However, this large central console screen turns into a superb reversing camera. The other 8-inch screen display provides speed and trip information and shows how the hybrid technology is working. The car has a head-up display onto the windscreen. Two small rotary knobs protrude from either side of the binnacle. One is the Drive Mode Select for Normal, Sport or Sport+. The other is to do with traction control. There’s one engine - a twin-turbo 299hp, 3.5 V6 petrol (€390 annual road tax) with two electric motors giving a combined power output of 359bhp from the Multi-Stage-Hybrid System, with a 10-speed automatic transmission. It can accelerate the car from 0-100km/h in 5.4 seconds. Most of my driving was on motorways and country roads with the occasional trip into town. This engine is so quiet for city driving - almost near silence - was also very smooth on the good roads I travelled with the air suspension playing its part, and has a really good turn of speed when required. Of course, the engine noise level increases when you use the sportier drive modes. Grades are Executive, Luxury, S Sport and Premium, each offers a high degree of passive safety for occupant protection in collisions; some can possibly help prevent crashes from even occurring, or can mitigate their effects. The entry level Executive grade is priced from €112,750 and has as standard, 19-inch cast alloys, a 12-speaker Pioneer sound system, Lexus Premium Navigation. My car was in the Luxury trim (from €122,750) and gets 20-inch wheels, air suspension, a superb 23-speaker Mark Levinson surround sound system, heated steering wheel, ventilated front seats. The F-Sport model (from €122,750) features special leather upholstery while the top Premium (from €148,750) has special alloys, a rear seat entertainment system and rear massage seats. This car is for those who appreciate the finer things in life and who can afford it.